Mr. Justice Muhammad Faisal Kamal Alam in his judgment has decided the issue regarding limitation and relinquishment of part claim in specific performance suit in Constitution Petition No. D-4843 of 2013. 2. The relevant facts leading to the present litigation are that private Respondents No. l to 3, being owners of an Apartment/Flat No.A-3, Ground Floor, Block-A, located in a multistoried project “Bath Island Apartment”, Karachi (the subject Property), entered into an Agreement of Sale dated 04.02.2003 with present Petitioner, in respect of the subject property for a total sale consideration of Rs.13,50,000/- (Rupees Thirteen Hundred fifty Thousand Only) out of which a part payment of Rs.2,50,000/- (Rupees Two Hundred Fifty Thousand only) was made to the above private Respondents (No.1, 2 and 3); however, the said Sale Agreement could not be completed which resulted in multiple litigations amongst the parties hereto. 3. The Agreement to Sell dated 04.02.2003 is appended as Annexure “P/2” (at Page-37 of the Petition), which is an undisputed document and will be referred to as the Contract. Initially, the private Respondent No.1 filed a Suit No.1911 of 2003, for taking the possession of the subject property from Petitioner, which was handed over to the latter for carrying out certain repairs, however, the stance of Petitioner is that the said possession was handed over as part performance of the contract. The said suit was contested by present Petitioner by filing a Written Statement; Issues were framed and the Parties led their evidence. 4. The Trial Court by its Judgment dated 10.08.2011, dismissed the above Suit of present Respondent No.1, inter alia, by holding that the possession of the subject property was handed over to Petitioner as part performance of the Contract and latter is ready and willing to fulfill his part of obligations. This Judgment was challenged in First Appeal No.202 of 2011, by the present Respondent No.1, which too was dismissed in favour of present Petitioner by the Judgment dated 20.04.2013 (available at Page-107 of the Court file), which has been challenged by the private Respondents in Second Civil Appeal No.64 of 2013, which is sub judice before this Court, as specifically mentioned in their Objections to the main Petition, which assertion has not been controverted by the Petitioner‟s side. 5. 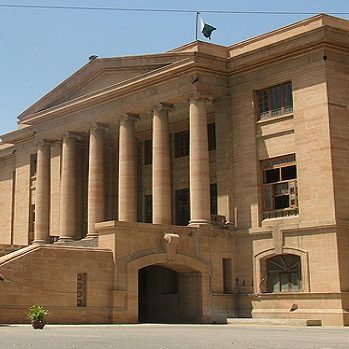 Choudhry Abdul Rasheed, learned counsel for the Petitioner has argued that the impugned Judgment passed in Civil Revision Application No.164 of 2012 is erroneous as it has misapplied Article 113 of the Limitation Law, while holding that subsequent lis (Suit No.1059 of 2011) filed by the present Petitioner was time barred, as three years limitation for filing the suit for Specific Performance is not applicable to the facts of the present case, because Petitioner was already in possession of the subject property as part performance of the contract by private Respondents as envisaged in Section 53-A of the Property Law. The leaned counsel has strenuously argued that the impugned Judgment warrants interference by this Court, as while exercising revisional jurisdiction, a plaint of the suit cannot be rejected by reversing the decision of the Trial Court, which has refused to reject the Plaint; the revisional jurisdiction under Section 115 of CPC is not a continuation of the original/suit proceedings like the appellate jurisdiction. The Plaintiff thus seeking issuance of writ of certiorari and has placed reliance on the case law, already mentioned in the opening paragraph of this Judgment. 6. The above stance of Petitioner is controverted by Mr. Raja Mansoor Mir, learned counsel representing Respondents No.1, 2 and 3. According to him, the Petitioner was / is in illegal possession of the subject property, which was initially handed over to him for carrying out only some repair and maintenance works and not as part performance of the contract. Learned counsel has argued that possession was handed over in terms of Clauses 5 and 8 of the said contract, perusal whereof shows that Respondents were handed over keys of the said property to the Petitioner to carry out repairs at the latter‟s cost. Learned counsel further argued that Clause 8 supplements Clause 5, which clearly provides that till the date of handing over vacant and physical possession to the Petitioner, all dues, rent and taxes as well as utility charges shall be the responsibility of Respondents as Vendors. Certified copy of deposition recorded in aforesaid Suit No.1911 of 2003 (filed by present Respondent No.1) has also been appended with the Objections as “R-1”. In his cross examination, the present Petitioner has acknowledged that the subject property was handed over to him under above referred Clause 5 of the contract. Present Petitioner further testified that before living in the subject property he was residing in an accommodation at Zamzama Boulevard as tenant. Learned counsel argues that it is not just logical that a physical and vacant possession was handed over to the Petitioner but all the charges and taxes in relation to the subject property was being paid by the present Respondent No.1. He further argued, by referring to Annexure “R-2” with his Objection, that even before the present lis (Suit No.1059 of 2011), the Petitioner also instituted a Suit for Permanent Injunction and Damages being Suit No.1469 of 2003 against the present Respondent No.1 and impleaded the Police Officials as Defendants. In that previous suit also Petitioner never pleaded specific performance of the contract though at that relevant time admittedly the above contract was there, as is also evident from the pleading of that earlier suit of the Petitioner. Learned counsel for Respondents has cited the reported Judgments which have already been reproduced in the opening paragraph of this Order. 7. We have thoughtfully considered the submissions of both the learned counsel representing the parties and with their assistance have gone through the record of the case. Further information regarding limitation and relinquishment of part claim in specific performance suit can be solicited from AUJ LAWYERS. Feel free to contact us in case you need any clarification and/or require legal assistance regarding similar matters. This entry was posted in Case Laws, Civil Law, Constitutional Law, Knowledge - Civil Law, Knowledge - Constitutional Law, Limitation, Litigation & Arbitration, Rejection of Plaint, Relinquishment, Revisional Powers, Sindh High Court, Solutions - Civil Law, Solutions - Constitutional Law, Specific Performance. Bookmark the permalink.